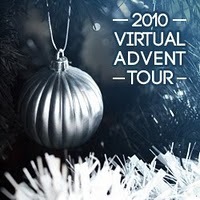 Welcome to Day 8 of the Virtual Advent Tour! This is a special time each year when the blogosphere shares how we celebrate at this time of year and stir up all kinds of festive cheer. I am Christian and I celebrate Christmas. I have loved Christmas forever, ever since I was a young girl. I used to count down the days starting in September, longing for the season to come. I always break out the Christmas music earlier than anyone else. I grew up in the Midwest where we sometimes had white Christmases. My family always savored the day, eating huge special meals, opening presents one at a time, and performing a family Christmas program before we opened them. The Christmases of my childhood and girlhood are special and beautiful. But Christmas now runs deeper. I am an adult. This year, I lost my job and I have yet to come into a steady source of income. I also lost my home..my roommates decided to move when our lease was up and I was too broke to live there on my own. And on the personal front, I had some conflicts with friends that were never resolved. While there were some definite bright spots in my year, it was also very difficult. Christmas ushers in the end of the year and it comes faithfully, every single year. There's no time to tell it so slow down, or wait until I'm happier or have more money for presents or in the mood. It just comes. And every year, just like when I was a little girl, I welcome it. But it's no longer the time of bright eyed wonder it was when I was a child. Instead Christmas sweeps in on dark cold days. The music of Christmas holds the memory of every shattered heart, broken dream, and serious let down of Christmas past. Christmas comes and with its stunning beauty, it brings its aching sadness. I believe in the religious story we associate with Christmas. I believe a young girl named Mary gave birth to a baby in humble circumstances and that baby was God wrapped in the flesh of humanity. I believe that single point in history is the most hopeful and radical of them all, a moment when God sent his reminder to mankind..you are not forgotten, you are not alone. You are not alone. This is to me the very most important message of Christmas. It's why we gather with our family, and open our home to strangers. It's why, I think, we give small gifts to others. To let them know they are not forgotten, they are not alone. It's why we write Christmas cards to each other and reconnect with the important relationships of our past. This year has been a difficult one. There are times I'm tempted to think based on the strength of my own emotion that God doesn't care. Every day I turn on the news and I wonder if we also have forgotten each other. It's the years like these we need Christmas the most. I need it. To set aside my fear, my hurt, my uncertainty and open up my heart, once again, to possibility. To love without reservation. To accept love and kindness. To believe that in fact, life goes on. That the hard grounds of winter are hiding away a secret of resurrection. That the isolation we feel every day as humans can be bridged, even if ever so slightly, through our efforts to be kind to one another. Oh how I want to believe.